I thought… wow, I mean double wow! Why do we have to go under the surgery knife when there are non-invasive ways to keep up with beauty norm? Yeah other than a pot of bb cream that promises a Dara-like spotless face skin, keke, we actually have endless choices at hand. Seriously, while the implication of all of these stuff runs deep in the political, cultural, social and economic fiber of women’s being, which probably I’ll find time some time writing my thoughts about the strong, inseparable and happy marriage of patriarchy and capitalism, I found my feministing mind amused with all of these and for now I beg your indulgence to just run through what I’m thinking. OK, so here we go .... pumping little lampoons on these stuff. So you’ve been thinking about life, yeah thinkin’ about your grumpy and grouchy and crabby boss and you get giddy and woozy and got a wrinkled forehead, this one works like magic, you see, it’s better off than Darna’s star-studded head belt, this strips off those wrinkles when you sleep with this band on – they call this, a goodnight stretcher, just be careful not to place this in your mouth, otherwise.. You know what will happen next, don’t you? And if that doesn’t work this one I guess would do the trick. I found this on a deal store and this sells cheap. I was actually looking for a white colored band you know to scare off my husband, but there was none. I didn’t know our primitive way of dealing with our dead can be a beauty course of therapy, you remember those Panchito movies, didn't you? Had this band comes in white, you only need cottons balls tucked in the nose to complete that crawl look. Fantastic. 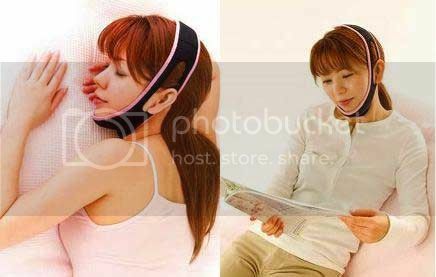 This one is another gadget to make your face looks slimmer. By the logical function of it, I think I needed one these to make my siopao-face, I just had a Tevanj siopao and Coke by the way, look like a five centavo coin. When did this beauty concept of having a small face ever started? We have a generous supply of make-up around then why make the face looks slimmer. Such a pitty. 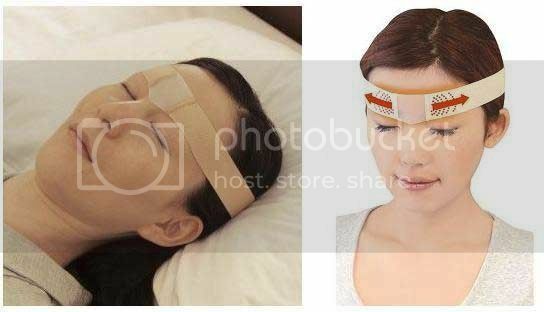 This gadget saves you from ala Charice controversy employing Botox to make the face looks a little tighter and slimmer, from constant chewing of gum, hahaha, at least this one can camouflage as a busted fancy headphones, its tolerable I guess. And one day, you’re looking at your resemblance on the mirror and you’re not happy about how the department of body works and noseways constructed your airways, it needs a little repair and you felt it too expensive to spend for a major redo, yeah instigating beauty austerity measures is a laudable action any woman can engage into. It actually didn’t occur to me until lately that a simple hair clamp I can usually buy at a Maranao sidewalk stall and that I threw around mindlessly can do the trick. Yeah, I guess the idea of why my mom back then told me to find a clip in the clothesline might have a real correlation on this. Though I thought I can tolerate this now since most clips are made in China and they are not as firm as the ones my grandfather has handmade that comes sturdy and strong since they're made of mature, sturdy bamboos. 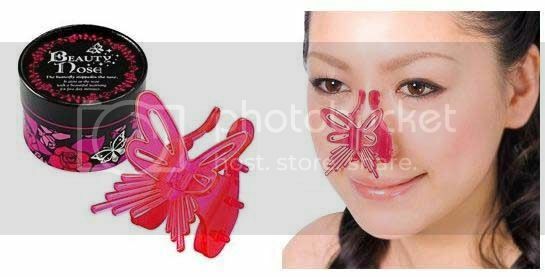 I won’t mind investing on a $42 butterfly nose clip should a result be apparent rather than undergoing surgery that might reverse my nose cavity that I definitely think would pose another problem. Still you’re not happy at all. Well, anyone who undergoes series of surgeries aren’t really as happy, a lot of studies suggest that once one started a procedure, they’ll like to replicate it again in another part of their body. 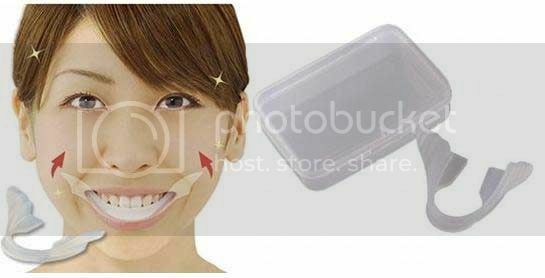 And since you’re not happy, don’t just go under the knife and do the ‘smile surgery’ why not try this one, this may look a little weirder at least they know how to train you smile, yeah, this is called a smile trainer. It’s been a while that I didn’t smile sincerely, yeah, everyone has its story to tell about smiling and all, and I think this is not the right post to tell it all. But, nonetheless, I think I can be helped by this trainer. Yeah, I suppose so since I think I’m just annoyed and wanted to vent it out for why in the world my life has been like this? I need some sort of anger management, I was thinking to come and enroll with the grumpy colored birds but I think they’re too minute for this. Culturally, the earthen ‘banga’ is what our oldies use before to store their sad and happy stories, you might have heard that from your lola and lolo, right? But since it’s too heavy to carry such a big ‘banga’ the Japanese had thought about designing a smaller and handy one. This is called the shouting vase, so don’t suppress your anger inside you, you’ll likely fart and you’ll end up sending your neighbors somewhere else; this will caught all those ‘tang-..na mus' and will make you feel better - yes, that's what this product promised. Hay naku, I think my head needs to cool off now, este my foot to cool off now…. Waaahhh, I so love this invention, I was thinking if there would be an eyeglasses with a fan on it I'll really root for it, but it seems like the invention was diverted - to the foot, I don’t know why it’s the foot, sort of stink management maybe. But you can have this usb fan attached to your phone and your foot can cool off like you're in an air-conditioned hall. Coooll! Seriously, I didn’t know I gone this far writing, I still have to do my thing , I should stop for now. whoa! i enjoyed this reading mommy vernz. the beauty stuff i rarely do, the washing and applying moisturizer is enough for me. that aircondition fan for the foot is so cool, handy on hot areas. hhahahahha this made me laugh. That's true, women these days have beauty rituals either before bed time of first thing in the morning. Although i do have beauty rituals too but that as extreme as those in the photo above. i only wash my face with oil free facial wash and apply oil free cream moisturizer in the morning. that's all. isn't that crazy? but i think some women just believe it that it will happened to them and for some reason faith is so powerful that they can see changes. but really, lol those are funny! oh, my! this is definitely insane...totally opposite from my beauty rituals...hehhee...I don't have one by the way...lol! the people who invented all these stuff are crazy!!!! hahahaha! uber vain!!! but it's actually not fun at all, but if one can't afford surgery, then they will have to resort to this. i love the nose clip!!! i need that! hahahaha! LOL these are so silly! Ladies will do anything for vanity! This is funny...but it can be serious. Way back when, scores of women in China mutilate their feet in foot binding to "look attractive." Women today go under the knife and starve themselves for the same reasons. The desire to look beautiful is not a bad thing, but vanity takes it into an unhealthy level. You made me laugh.. the best invention is the foot.. stink management that is!